HONOLULU – Hawaiian Airlines, one of the nation’s longest-serving carriers, today celebrated its 88th anniversary at a dedication ceremony for the new Charles I. Elliott Maintenance and Cargo Facility, named in honor of the man who piloted the company’s maiden flight from Honolulu to Hilo on this day in 1929. The 21-acre site includes a 295,800 square-foot aircraft hangar that can accommodate up to five Boeing 717 aircraft at the same time, as well as indoor maintenance and cargo operations, a two-level office building and 143-stall parking lot. Hawaiian’s previous open-air maintenance hangar and cargo facilities have been in use since 1962, when what is now Honolulu’s Daniel K. Inouye International Airport (HNL) was first built. Following more than half a century of operations in the now outgrown and outdated facilities, the next chapter of the airline’s history began this week as employees started moving in to the new building. Capt. Charles Irving “Sam” Elliott also served as Director of Operations at Inter-Island Airways and his first job at the airline was as inspector of Hangar No. 1. When the company dug the hole for the foundation, he ensured it was deep enough to hit solid coral, inspected the steel work, and hammered the first rivets. Soon after, he piloted the first scheduled flight: a one hour and 40-minute flight on a Sikorsky S-38 amphibious aircraft from Honolulu to Hilo on the Island of Hawaii, via Kahului, Maui. Capt. Elliott was an aviation pioneer and a man of many firsts, having also flown the first inter-island air mail flight on Oct. 8, 1934. The following year, he took delivery of the first Sikorsky S-43 ever built and flew it cross-country from Bridgeport, Conn, to San Francisco, from where it was shipped on a Matson freighter to Hawai‘i. He was at the controls for the S-43’s inaugural inter-island flight in December 1935, and he later became the first Hawaiian pilot to fly a Douglas DC-3. He retired in 1951 after 22 years of service. The state-of-the-art Charles I. Elliott Maintenance and Cargo Facility will house more than 1,100 employees from cargo, maintenance, engineering, supply, fleet service, claims, and safety and security. 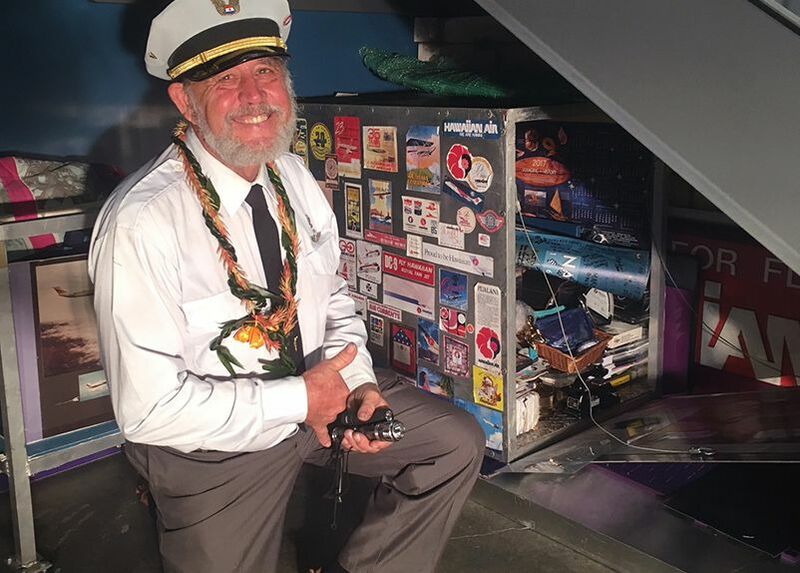 To preserve its past as it looks toward the future, Hawaiian also marked today’s special occasion by enshrining “HAL,” a Hawaiian Airlines Time Capsule, beneath a stairwell in the new facility. A miniaturized reproduction of an LD3 cargo container, HAL was imagined by Hawaiian’s Archivist, Capt. Rick Rogers. Capt. Rogers joined Hawaiian in 1987 as a De Havilland Dash 7 pilot and went on to fly the Douglas DC-8 and DC-9 aircraft, then the Boeing 717s and 767s before leaving the cockpit in 2010 to launch and manage an archive rich with 88 years of memorabilia. HAL encases historical documents, publications, plaques and awards, posters and photographs along with a complete digital copy of the airline’s archives, including approximately 100 oral history interviews gathered over the past few years. Throughout 2017, the Time Capsule made appearances in the airline’s break rooms and Premier Club lounges across Hawai‘i, the State Capitol, and the U.S. Senate building in Washington D.C. The intent is to re-open HAL on Nov. 11, 2079, the airline’s 150th Anniversary. Hawaiian currently operates a fleet of 24 Airbus A330s, 20 Boeing 717s and eight Boeing 767s. It also provides turbo-prop flights using three ATR-42 aircraft via its ‘Ohana by Hawaiian service, which will soon commence an all-cargo operation via ATR-72 aircraft. The airline last month took delivery of the first of its 18 new A321neo aircraft that will start service in early 2018, expanding flight offerings between the U.S. West Coast and Neighbor Islands. The Charles I. Elliott Cargo and Maintenance Facility and the A321neo aircraft are the next steps in a series of major investments Hawaiian has made in recent years to aircraft cabins, lounges, and other aspects of the customer experience to elevate the carrier’s position as the preferred airline for travelers flying to and within Hawai‘i for the next century to come. Now in its 89th year of continuous service, Hawaiian is Hawai‘i’s biggest and longest-serving airline, as well as the largest provider of passenger air service from its primary visitor markets on the U.S. Mainland.